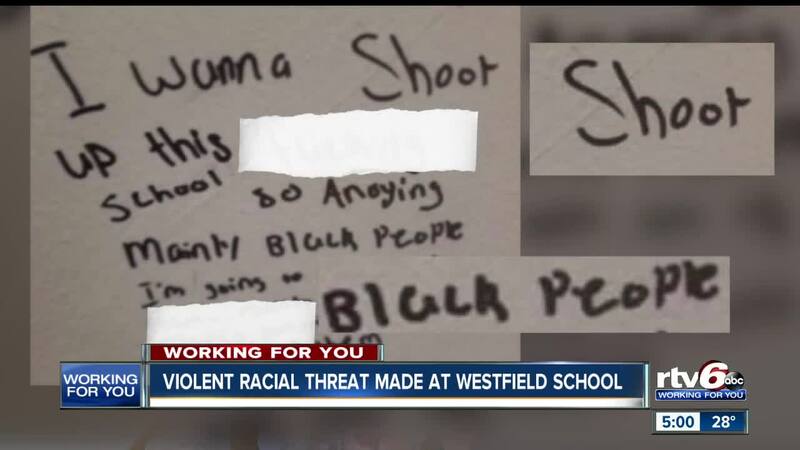 After a second threat was found written on the wall at Westfield High School last week parents say they’re worried about their children’s safety and some of them are even keeping their kids home because of it. WESTFIELD — After a second threat was found written on the wall at Westfield High School last week parents say they’re worried about their children’s safety and some of them are even keeping their kids home because of it. The second threat, which parents called terrifying and violent, was found written on the wall of a stall in the boy’s restroom at Westfield High School. The person who wrote the threat said they wanted to shoot up the school, mainly black people, and went on to list four students by name. The school sent a letter home to parents on Friday saying Westfield Police were investigating the threat, which was the second one they had found that week. Some parents say they weren’t taking chances and decided to keep their children home from school on Monday. That mother, who asked not to be identified, said she’s glad police are investigating the threats, but it doesn’t ease her concerns and she won’t feel comfortable again until the student who wrote the threat is found and dealt with. A spokesperson with Westfield High School says they are working with police, but would not go into detail about whether any arrests had been made.